With VS 2012 (and above), those versions have removed the capability to create deployment projects. We use 3rd party tools to build setup/MSI packages at the moment. This works very well for us in our on-prem environments. With the integration of cloud services, we took the approach of consolidating most of the build process and output to our cloud instance. This also means, having the capabilities of hosted (cloud) build controllers to make use of other 3rd party tools (in this case build MSI’s) however, we cannot install additional apps on hosted cloud build controllers. The other approach was to use hybrid solution where we use build services on the cloud however the actual build controller resides on our on-prem infrastructure. This was an approach that I’m willing to take but I’d like to take it further and really push all the mechanisms to the cloud. Further researching, VS 2012 (and above) still has the capability to develop setup projects. 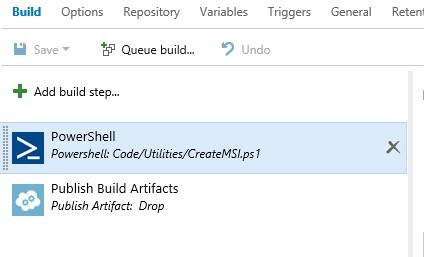 The only downside is that: It’s a separate extension in Visual Studio (which is really not a big concern) and that MSBUILD doesn’t support building deployment project files (.VDPROJ). Luckily, devenv.exe (when used correctly) allows you to build solutions with deployment project files. More importantly, you can run it on a command line and with the right switches, you can build deployment projects files which outputs MSI packages. 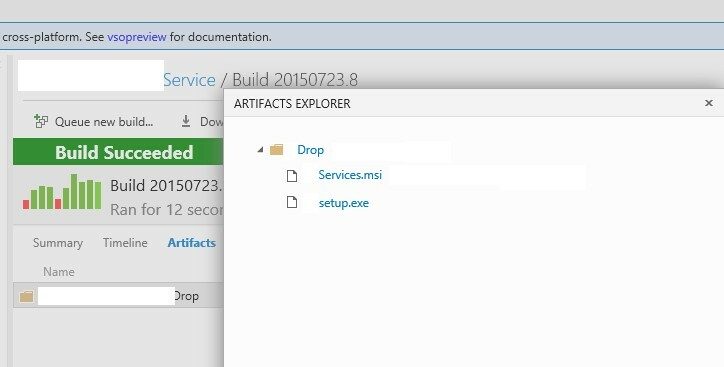 Note that given some of our MSIs are used for deploying web applications (Yes, let’s have the discussion later why we use MSI’s for web deployments J), the article above is suitable for this context.The end result though is generating MSI’s regardless whether it’s a Web or Windows setup project. Start-Process -FilePath "C:\Program Files (x86)\Microsoft Visual Studio 12.0\Common7\IDE\devenv" -ArgumentList "$SolutionPath /build $ConifugrationMode /project $ProjectPath /projectconfig $ConifugrationMode"
In our case, we use VSO GIT. The script file doesn’t need to go on any folder structure as you will see later. 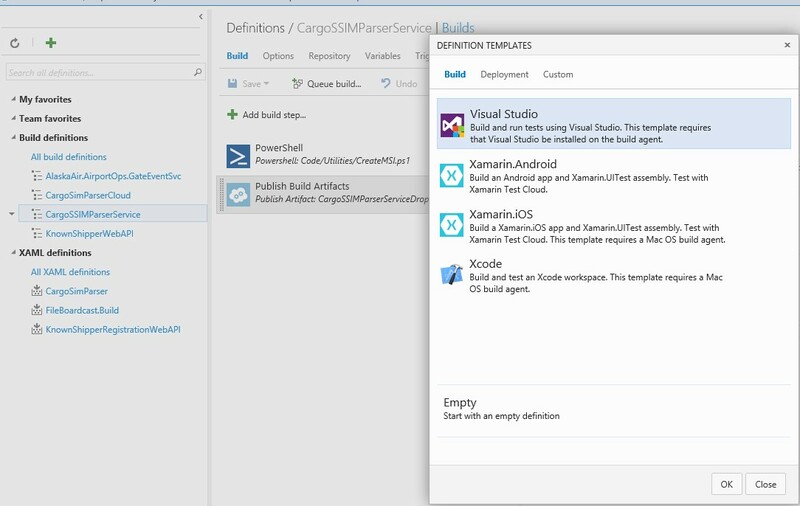 Start of by creating a build definition in VSO. Go to “Builds” in your team project, click on the “+”. Select Visual Studio. (Note that probably this UI may change given that features and changes do occur more frequently in VSO). The key for this step is to ensure that you provide the correct set of variables for the location for your solution and project file. Artifact Name: This is just the name of your drop location.